Bathroom vanities and bathroom cabinets to fit any style. It ties together the overall look and feel of the room’s décor, and is what makes it one of the home’s most peaceful havens. The type of bath vanity sinks and cabinets you select indicates your style and taste. DécorPlanet.com carries hundreds of bathroom vanities to reflect that taste, whether you prefer a bath vanity in a contemporary, baroque, classic or any other design. Is Your Ideal Bathroom Vanity Modern or Classic? No two bathrooms are alike—because no two customers are alike. That’s why we stock our digital catalog with everything from minimalistic, streamlined styles of vanities to ornate, antique style vanities. Just click on “modern”, “contemporary”, “antique” or the category that most intrigues you. You can also browse by price, popularity and manufacturer, to name a few additional categorizations. So is your ideal bathroom vanity modern, classic or something in between? Shop now and get the best prices on the web. 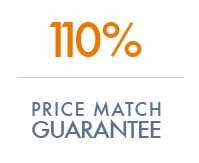 We’re so confident in our prices on bathroom vanities and cabinets that we offer a 110% price match guarantee. If you find the same bathroom vanities for sale elsewhere for less, we’ll match that price—and then give you an additional discount! Single sink: Perfect for small bathrooms and bathrooms with low traffic. Double sink: A must for bathrooms with ample space shared by multiple people. Perfect for a family bathroom or a master bathroom for two. Cabinets: These types of vanities include a small or a large cabinet below or to the side of the sink for bathroom storage that matches the décor. Pedestal basin: Contemporary décor or minimal bathroom space make a pedestal basin vanity pop. Cleaning is easy because the sink takes up little space. Glass: “Glass” refers to the sink. Whether you’re outfitting a modern style bathroom or your bathroom doesn’t have a particular style, glass vanities fit elegantly into their surroundings. Antique: Classic bathroom styles decked out in earth tones such as copper and bronze look incredible with antique vanities. Modern and contemporary: Sleek edges and bold colors such as black, white and oak. A must for the modern décor bathroom.